Patti wrote: Perhaps to you my thoughts seem associative and related to doing readings. Yes, absolutely I can say most of my methods I use in reading hands have evolved over the years from interaction with hundreds and hundreds of live samples to observe in and out of their habitats. I definitely have come to not base my readings and interpretations on *applied meanings*. Archetypes, elements and labels are mostly just that for me, labels and memory triggers. "how can you describe a cognitive function (such as 'will' and 'logic/reason', which are both know as aspects of the 'inner world') to be representing a part of the 'outer world'?" I don't see how the Aristotle quote ("… (the hand) is the organ of the organs, the active agent of the passive powers") could become helpfull regarding my question. My question relates to the two phalanges of the thumb only, while the Aristotle quote relates to the full hand. If you think the pinky is related to both the inner- and outer world, which principles are you using to describe it's connection with the inner world? I wonder why this discussion has become reduced to the very thing you pointed out it shouldn't in your first comment. When this topic gets reduced to philosophical viewpoints and opinions, this thread will become endless and pointless. There are some good points in the book "The Philosopher's Toolkit" that give another view as to what this thread has become. "In 1628 William Harvey invented the circulation of the heart." Actually he discovered what the heart did, and did not invent circulation. This is what is happening here. The hand maps (inventions) are being mistaken for discoveries. I don't really use in practice the terms "inner/outer and conscious/subconscious". I don't use the elements for references. The little fingers (and the thumbs) are the last to finish development. In development, if there is a lot of construction material, you get bigger and if there is less material, the resulting product is smaller. A robust human would therefore be one that has enough material and time to complete a proper balance in growth. A weaker being is one that is likely deficient in some area and must learn to compensate for this imbalance. The little finger is associated with the lower chakras. This area of the body relates to our reproduction organs and a major source of elimination. Very often malformations here (little finger and mount below) relate to malformations in these organs and sometimes the lower limbs. Sexual communication is the most personal and private form of communication but for those who make it their profession it becomes less intimate and easier than personal conversation. It's about the degree a person is willing to expose what makes them feel vulnerable. A question has slowly emerged in my mind after going again through this thread. This 'inner'/'outer' & similar discussions do help much in theory; but how is it useful in the practical palmistry? And certainly, the Craft of Palmistry, & other similar crafts, should have some use. The practical use being more relevant in the modern world??!!? RohinRanjan=BUT thereafter we must not remain SLAVES to those shackles and must not lose the two WINGS: Logic and Imagination! Imagination is a wide cloud but within it also lies Intuition! The above written is a 'Whammy'! Yes, sexual communication is the most personal and private form of communication; so, despite what people associate with 'intimacy', intimate relationships are a form of interpersonal communication... and thus relate to the outer world. However, 'intimacy' itself concerns a feeling (which of course relates to the inner world) - but one can speak of a close affective connection with another person as a result of a bond. Johnny Fincham associates the pinky finger with a specific form of 'dialogue' (which requires the presence of a person in the outer world). So, despite that feelings are involved with 'intimacy'... it does require the outer world (another person) to exist. So, I still find it hard to relate the pinky finger with the inner world. And by the way, Johnny Fincham's name for the pinky finger - his speaks of the 'Antenna finger' - is a nice illustration of the fact that the pinky finger usually is associated with issues that relate to the outer world. 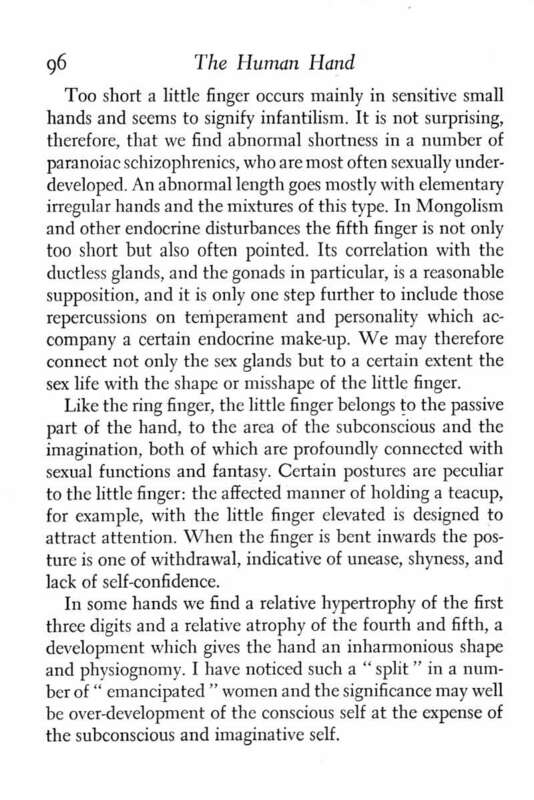 As far as I know, only Arnold Holtzman presents a view where the little finger is directly associated with the inner world; he speaks of 'the inner image of self'... but I have no idea how Holtzman arrived at this perception, and I find it rather unusual to see that his description looks very similar to how the usual associations regarding the index finger - so we can hardly connect his work with the works of other authors in the field of hand reading. However, since I realize that Holtzman is talking about a psychoanalytic perspective it is hard to get a grip on his use of language (even for a me as an academic educated psychologist). Anyway, Patti thanks for your answer! It's about the degree a person is willing to expose what makes them feel vulnerable. The 'exposure' is an outer expression of the inner state of being vulnerable. That holds true for every aspect of the hand. Like the analogy Kiran provided. There are switches (inner/outer) in every room, Here you are speaking of the 'room', the little finger. Self expres​sion(communication) does not need an observer in order to communicate. All fingers and thumb are antenna like, sending and receiving signals. "Genuine intimacy in human relationships requires dialogue, transparency, vulnerability and reciprocity." Yes, the aspect of 'vulnerability' is an essential aspect... but dialogue, transparency & reciprocity are essential as well, and thus the presence of another person (= outer world) is necessary. Beyond the info provided by Wikipedia, I think we should also be aware that feelings of vulnerability in isolation (without the presence of another person) can also very well be the result of neurotic tendencies - which more relate to the personality-structure of a person. So, yes... 'vulnerability' is one of the key-aspects of intimacy, but there are a few other aspects required as well - which all appear to indicate that the presence of (or communication with) another person is required to CREATE intimacy! Thank you for sharing your perceptions regarding this specific aspect of the pinky! Vulnerability is related to more than intimacy. i.e. It can relate to things like honesty and being straightforward or not. People lie at times to cover up or avoid revealing the simplest things because they cannot come up with the courage or whatever to speak up. Some people find admitting their mistakes makes them feel vulnerable. These things vary in the moment, situation and the person. Patti wrote: Vulnerability is related to more than intimacy. Sure Patti, I recognize how your description relates to the core-aspect of 'vulnerability'. However, while 'intimacy' and 'relationships' have been associated frequently with the pinky... I think 'vulnerability' is only associated with a short pinky. So, I could here argue here that 'vulnerability' could also result from problems with intimacy (and/or relationships). But as far as I know, as a quality 'vulnerability' has not directly been associated with the pinky in general. However, Patti maybe you know a source which connects 'vulnerability' with the pinky - without the reference that it can result from a short pinky? PS. Not sure that I have explained this well enough... basically, I think we can discriminate two types of 'vulnerability': 1) vulnerability as a QUALITY associated with a normal level of intimacy; 2) vulnerability as an INABILITY, often resulting from dealing with problems related to intimacy (or other issues). I think the descriptions at Wikipedia (http://en.wikipedia.org/wiki/Vulnerability) suggest that the word is usually associated with the latter. What is your thought on this Patti? Can you associate your thoughts with one of the 2 types that I described? Or maybe both? Why quote a source? My experience is my resource. Patti wrote: Why quote a source? My experience is my resource. I asked for a source because I wonder whether you know any hand reading authors who associate 'vulnerability' with the pinky. So far I am not aware of such authors, but if you can give me just 1 author... then this would confirm that your perception has spread in the field of hand reading. (I hope you understand that I am trying to avoid that we focus too much on associations of individuals that so far have never been described in the books at all). I hope you don't mind me for asking? Perhaps Mark Seltman would join the discussion...? I get the feeling he has come to a similar realization of vulnerability and people's abilities in varying degrees to expose themselves. Although in this quote he is not referring to particular parts of hands. Thanks Patti, on his blog Mark connects the word 'vulnerable' twice with the water hand type (he calls it 'feeling types'). While working with Liz Hallows on her research with the MBTI (Myers Briggs Type Indicator) personality profiler it became very clear that we express ourselves largely based on preferences. We gravitate to what nourishes us and retreat from what causes discomfort. This moving toward what nourishes us, can empower us. We retreat to protect our vulnerabilities. This vulnerability and empowerment relates to the degrees to which a person feels capable of 'putting themselves out there' as well as letting outsiders in. This involves the entire hand (wholly and compartmentalized) and the concept of polarities. We're on a similar wavelength or perhaps our discussion inspired this blog post. Has anyone written that the thumb is the source of the witness, THE I , that watches , what memories are running , counter will to an action that is about to be begun, the quiet watcher over ones whole mindscape. Who sees the joy inside and out, with no opposite. The knower of the field. knox gillespie wrote: Has anyone written that the thumb is the source of the witness, THE I , that watches , what memories are running , counter will to an action that is about to be begun, the quiet watcher over ones whole mindscape. Who sees the joy inside and out, with no opposite. The knower of the field. Yes Knox, I have mentioned the 'I' in the first post (see the list of synonyms). Anyway, thank you for your interesting description! For some reason I'm not seeing any content on that page, only menus. Tried a google search but still nothing showing when I try the cached page. I don't think anyone denies that there are inconsistencies in Terry Dukes work. Sorry Martijn I'm having difficulty following some of the arguments that you presented me with on Friday. Yes, correct that Dukes said that and I agree with it. I have never used these. For example water=energy .... ALL the elements are forms of energy! Communication I would associate mainly with air element. ... the more I am thinking the palm represents the inner world and the fingers & thumb represent how we connect that to the outer world. " Even tho the way I wrote it makes it sound like it just occurred to me, actually I've always made that association of the fingers & thumb connecting the rest of the hand with the outisde world. "If you think of the energy of the hand being expressed out through the fingers, horizontal lines on phalanges obstruct or block the energy flow." is taken from my teaching notes from 13 years ago. On page 1 of this discussion I said "I believe the thumb has the effect of integrating the rest of the hand and that the thumb is the final expression of all this combined energy out into the world." - again this has been my understanding for probably at least 15 years. So, I didn't just 'make a move' after your words last week! It seems to have gone missing. The link is still in Twitter when you search #palmistry in the search box, but the article seems to have gone missing. It spoke of the multi-directional and multi-dimensional energy of the hands. Leaned in the direction of how I see the hands, too and contained a lot of what has been posted here in the author's own words and perspective. Thanks Patti, I couldn't find any of his articles that are listed in various links on google & on that website. But at least now I know it is not just my computer that isn't showing it. I've been away to Glastonbury for a couple of days and didn't have my palmistry head on! Hence when I first read recent posts and re-read some old ones, it made no sense to me at all! I'm sorry there are so many posts on this thread that I would like to respond to, and had not time, hence I have focussed on Martijn's where he is addressing me specifically. I didn't exactly put this forward as a 'principle'. The principles we use in 5-element hand analysis are the principles of the elements as we can observe them in nature, in the world all around us. The full quote above was "What we see most about people is their physical body and their actions (earth & fire). Their thoughts and emotions (air and water) are more hidden. So in this sense, earth & fire are more outer and air & water are more inner." That's a general statement that you can apply for example when you observe people walking down the street. You can see earth and fire aspects of them (body shape and movement), you can't see their water & air (thoughts and emotions).
" the dorsal side relate to 'public' and the palmar side of the fingers relates to 'private' - so this could implicate that Dukes described how the dorsal side of the hand to 'outer world' and the inner side of the hand to 'inner world'!!)" Yes. Again observe people in the street. You don't often see the palmar side of people's hands, you usually see the back of the hand. So the back of the hand is the more public (outer) face, the palmar side is the more private (inner) face. (For the moment I will describe below the implications of this principle... which are usefull to explain your earlier input regarding radial = outer and ulnar = inner; however, then I will also describe/proof how these principles actually appear to be a violation of various fundamental principles described by Dukes: because Dukes described that each aspect of the hand possesses an inner and an outer aspect. Are you talking here about this quote from Dukes? "When we observe hands we must be aware that each function we can see represented in them possesses an inner and an outer aspects. Each line representing an outer manifestation of consciousness and also has a line reflecting an inner manifestation." If so, he is not exactly saying that each aspect of the hand possesses an inner and an outer aspect (although I might be able to agree that it does!). He is saying that "each function we can see represented in them possesses an inner and an outer aspects. Each line representing an outer manifestation of consciousness and also has a line reflecting an inner manifestation." eg major water line (heartline) also has the corresponding inner lines of upper minor water line (Girdle of venus), true minor water line (line of intuition), lower minor water line (via lasciva) - and incidentally for the main part these minor water lines are on the ulna side of the hand (which I class as more 'inner'). I don't think these ideas are simple, I think they are very complex. I think other members of the C.Soc explain them much better than I do, I am limited by my short air line so I can't go into philosophical areas so easily. OK from here on, you have lost me Martijn. But earth finger is half on radial side, half on ulna side, the balancing finger of the hand. No, because it is on radial side, in conjuction with the thumb it shows how we assert our inner desires & self / ego out to the world. You don't seem to be taking into account that the water finger has 3 phalanges - water, fire, air. It also has a fingerprint that could be ruled by any element. So the 'points' system you have tried to apply to all this, just doesn't make any sense to me! You are the creator of 'multi-dimensional hand reading' yet you don't seem to be applying that 'mutli dimensional' way of thinking to the elements! because as I've already said, there is much in Dukes' book that I don't follow, and this is one example, because..... all the elements are some form of energy! I associate air more than water with communication. Evaluation I would also associate more with air element. sorry, after that you lost me. I don't understand half of it, you lost me at some point. OK Martijn, feel free not to include inner/outer in the labelling of your diagram with regard to your conclusions about 5-element hand analysis. How does your diagram compare with traditional palmistry & inner/outer or active/passive sides of the hand? I mentioned earlier in this discussion that some authors talk about this disctinction (eg David Brandon-Jones, Sasha Fenton & Patti mentioned Julius Spier, there are probably more that we haven't mentioned) and why is radial Mars known as active mars whereas ulna Mars is passive Mars? Sorry but I think you are still confused by many fundamental aspects & principles of the elemental system. But I give you credit for even beginning to try to understand Terry Dukes book! It is difficult to understand even when English is your first language (I needed a dictionary next to me when I first read it). Tho I would not recommend this book, too much nonsense in between the important sensible points. Lynn, if we combine both elements presented by Dukes in the quote above... then one could say that Dukes sort of has described how every aspect of the hand has an 'inner' (represented by the palmar side) and an 'outer' (represented by the dorsal side). But if you accept this as the starting point of the elemental system... then I think it becomes troublesome when one also adopts any view regarding radial- and ulnar side, simply because by principle this creates a contradiction regarding that starting point! Are you able to visualize what I am saying here? I understand your theory regarding the thumb as an 'integrator' as a starting point. However, with this starting point I think one can still apply the inner vs outer them on the other four fingers. Then, if you associate communication with air... it would make sense to associate the pinky + the palmar air quadrant with the outer world - because these represent the air zones of the hand and communication is by principle a matter that directly relates to the outer world!!! And in this perspective, it would not make sense to associate the ulnar side of the hand with the inner world... because in the perspective of your starting point regarding thumb, you would have to specify that to that all four fingers + the palm sort of represent the inner world... so then you would not be speaking of the ulnar side, you are then speaking about the full hand except for the thumb! NOTICE: Patti & I have searched for key-worlds in the hand analysis literature that associate the pinky with the inner world (because the classic key-words associated with the pinky finger - e.g. communication, relationships, intimacy - all appear to relate to the outer world). But so far it appears that Patti & I could not identify any CLASSIC 'inner world' key-words that have been associated in the hand reading literature with the pinky finger. Maybe you are able to name one 'inner world' key-word that relates to the pinky? Or the archetype of mercurius? Lynn wrote: I've been away to Glastonbury for a couple of days and didn't have my palmistry head on! Hence when I first read recent posts and re-read some old ones, it made no sense to me at all! I'm sorry there are so many posts on this thread that I would like to respond to, and had not time, hence I have focussed on Martijn's where he is addressing me specifically. Lynn, thanks for making this suggestion not to include any inner/outer in my diagram regarding the elemental system. Yes, basically I could argue here that both the elements water (Dukes) & air (you & Hirsch) are associated in the elemental system with 'communication'... and because 'communication' represents a core-issue that relates to the outer world, I think it would not make much sense if any elemental-student would associate the ulnar side directly with the inner world. This observation of mine is sort of confirmed by Fincham's descriptions that 'communication' is an issue that relates to the pinky finger (he has named the pinky the 'Antenna of Communication')... and thus this finger should for this reason in the elemental system not be associated with the inner world. And Dukes approach towards the dorsal/palmar side also provides illustrative support for my observation. NOTICE: By the way, I could also point out here that Fred Gettings (who preceeded the work of Dukes) has presented an alternative elemental system... where the pinky finger e.g. gets associated with the element earth and the thumb with the element fire!??? It appears that the each of the elemental-authors have sort of presented a (slightly) different set of fundamentals, but it is not easy at all to see how much the works really differ from each other. So far it appears that Hirsch's work is probably most representative for Christopher Jones' work (because Fincham's work also many includes other influences that go beyond the elmental approach... which could explain why he has developed his own vocabulary, e.g. he talks of 'palmistry'... and not 'chirology', etc.). By the way, regarding your question about 'active/passive'... to me those are rather abstract words, and since I am aware that authors have used contradictive models for that dimensions as well (e.g. Gettings associates the fingers with 'active' and the palm with 'passive') I have little interest to start a discussion about that dimension - especially since I think that the majority of the hand reading authors have not started using those words in their writings.